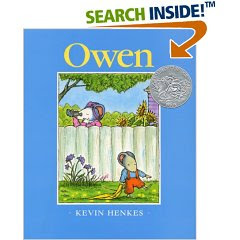 Owen is a simple and a heart warming story of a little mouse, who is deeply attached to his yellow blanket. The yellow blanket named Fuzzy by Owen, goes with him everywhere. Saying an emphatic NO to Owen. Owen outwits them and nothing can stop him from carrying his beloved little thing everywhere. Finally without the neighbour's interference, the mother thinks about what will work for her little one. She comes up with such an excellent idea that Owen does give up his blanket, but still gets to keep his favourite comforter. So what does the mother do, so that both Owen and his mom are happy in the end ?. Read the book and find it for yourself :-). Sooraj and me loved this book because we could relate to it so well ! Sooraj had a similar "yellow blankie" when he was around 1.5 years old. He needed that to go to sleep. So wherever we travelled that would be the first thing to go into the luggage ! I don't remember for how long he used that, because at one point of time the attachment to that yellow blankie stopped. It did not seem very important to him. May be that was an indication he was growing up :-). This book is a 1994 Caldecott Honour book. The other books of Kevin Henkes reviewed here in Saffrontree are Kitten's First Full Moon and Jessica, by Praba. Love it! A small pointer - award-winning stories are available in scholastic DVDs too... These DVDs are wonderful in the sense that they reinforce the story and it's better than watching TV. You get a collection of four/five stories in one DVD. Huge Kevin Henkes fan - something about his simplistic drawing/writing style and down-to-earth, kid friendly themes...And his mouse characters are adorable - Chrysanthemum, Owen, Lily...We read KH's Lily's Purple Plastic Purse just last week - funny K LOVES stories that are set in classrooms! Wow..they are available in DVDs too ..that's cool. I should see if I am able to get them. Thanks for this info. I have not checked the other mouse stories...I will do them soon. May be K loves her school so much that she enjoys stories set in class rooms ! 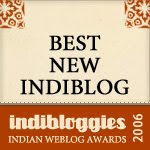 Oh Ranjani, you should not have withheld the ending:( I can't wait to find out! My daughter never gets attached to one thing in particular - not sure if its a good or bad thing:) But we have read many stories on this subject and am excited about introducing Kevin Henkes books to her. Thanks!